Official Recognition of the Community. Russian city; capital of the government of the same name. Jews began to appear in Moscow in early times, but only as individuals; for instance, as farmers of the taxes which the Russian princes paid to the Tatars. A Jew named Leo was physician to the court at Moscow in 1490. From the beginning of the sixteenth century to the middle of the seventeenth Jews were excluded from the city on account of religious enmity toward them. It is known that Ivan the Terrible refused the request (1549) of the Duke of Lithuania that Jews might visit Moscow for commercial purposes; and it was agreed at the election of Ladislaus in 1610 that Jews should not be allowed to enter the city. This agreement is met with in more recent Russo-Polish treaties, which leads to the belief that, notwithstanding the prohibition, Jews had continued to visit Moscow. Toward the end of the seventeenth century the city contained a more or less prosperous group of Jews, whose presence some writers have attributed to the influence of the Jewish court physician Stephan von Gaden. In 1676 Czar Feodor Alekseyevich forbade them to remain; and this prohibition was continued in the succeeding reigns. Conditions underwent a change in the reign of Catherine II. With the separation of White Russia from Poland and its addition to Russia proper (1772), the numerous Jewish populations of White Russia came under Russian rule. They were indeed the first Russo-Jewish subjects. Jewish merchants from White Russia, particularly from the town of Shklov, began to arrive in Moscow, but they remained only for short periods. Moscow was then outside of the Pale of Settlement; and the petition of the Jews for admission to the Moscow merchant gild was rejected. The well-known Jewish merchant Notkin, however, was at that time engaged in important commercial affairs at both capitals. With the further addition to Russia of Polish territories Jews from other governments came to Moscow. All these temporary visitors were permitted to stay only in a certain house, known as the "Jewish Inn." This was located in a building near the Church of Boris and Glyeb, and consequently was named later "Glyebovskoye." It formed a sort of ghetto. The gates were locked at nightfall, and no one was allowed to pass out after dark. Beginning with the second decade of the nineteenth century the Jewish population of Moscow began to increase. Merchants and their clerks as well as young artisans were permitted to remain in the city temporarily, on condition that they dwelt exclusively at the Jewish inn. All visitors were questioned at the city gates. Christians were admitted freely; but Jews were passed through accompanied by a guard, and frequent tribute was levied upon them by various functionaries. In the following decade Moscow received a group of permanent Jewish settlers. From the year 1827, during the reign of Nicholas I., the Jews were compelled to serve for twenty-five years in the army. Many such Jewish soldiers were sent to Moscow. During the early years of their service there they were engaged in active duty; but later they settled with their wives and families in the town (a privilege not accorded to the inhabitants of the inn), and engaged in business and handicrafts. They established several houses of prayer bearing the respective names of the regiments in which they served, e.g., "Arakcheyevskaya" and "Mezhevaya." They had no rabbi, however, even the position of government rabbi, established under Nicholas, remaining vacant. The records of deaths were kept by the police, while marriages, divorces, and births were registered by the regimental officers. About this time a separate Jewish cemetery was established. Until then the Jewish dead had been buried just beyond the boundary of the Christian cemeteries, most frequently in the Dorogomilovskoye Cemetery. In the reign of Alexander II. the Jewish population of Moscow increased still further. The ghetto was abolished; certain classes of Jews (artisans, merchants, and persons possessed of a higher education) were given the privilege of unrestricted residence, and many such established themselves in the city. 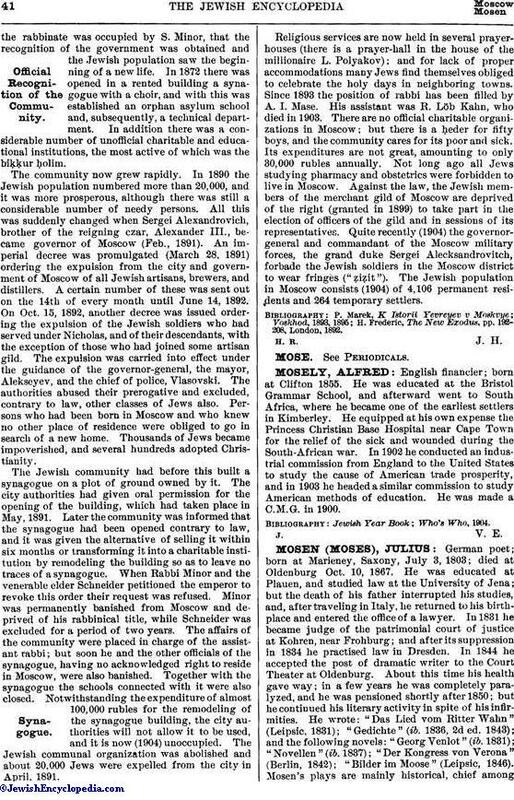 Moreover, the local authorities assumed, for selfish reasons, a more favorable attitude toward those Jews who lived in Moscow without having the right to do so; so that in 1871 the Jewish inhabitants numbered about 8,000. The early supremacy of the veteran soldiers in communal affairs passed over to the more intelligent classes. At this time were founded the first Jewish charitable institutions. About 1868 the congregation had a rabbi named Berlin. The community was, however, not yet officially recognized. It was not until 1871, whenthe rabbinate was occupied by S. Minor, that the recognition of the government was obtained and the Jewish population saw the beginning of a new life. In 1872 there was opened in a rented building a synagogue with a choir, and with this was established an orphan asylum school and, subsequently, a technical department. In addition there was a considerable number of unofficial charitable and educational institutions, the most active of which was the biḳḳur ḥolim. The community now grew rapidly. In 1890 the Jewish population numbered more than 20,000, and it was more prosperous, although there was still a considerable number of needy persons. All this was suddenly changed when Sergei Alexandrovich, brother of the reigning czar, Alexander III., became governor of Moscow (Feb., 1891). An imperial decree was promulgated (March 28, 1891) ordering the expulsion from the city and government of Moscow of all Jewish artisans, brewers, and distillers. A certain number of these was sent out on the 14th of every month until June 14, 1892. On Oct. 15, 1892, another decree was issued ordering the expulsion of the Jewish soldiers who had served under Nicholas, and of their descendants, with the exception of those who had joined some artisan gild. The expulsion was carried into effect under the guidance of the governor-general, the mayor, Alekseyev, and the chief of police, Vlasovski. The authorities abused their prerogative and excluded, contrary to law, other classes of Jews also. Persons who had been born in Moscow and who knew no other place of residence were obliged to go in search of a new home. Thousands of Jews became impoverished, and several hundreds adopted Christianity. The Jewish community had before this built a synagogue on a plot of ground owned by it. The city authorities had given oral permission for the opening of the building, which had taken place in May, 1891. Later the community was informed that the synagogue had been opened contrary to law, and it was given the alternative of selling it within six months or transforming it into a charitable institution by remodeling the building so as to leave no traces of a synagogue. When Rabbi Minor and the venerable elder Schneider petitioned the emperor to revoke this order their request was refused. Minor was permanently banished from Moscow and deprived of his rabbinical title, while Schneider was excluded for a period of two years. The affairs of the community were placed in charge of the assistant rabbi; but soon he and the other officials of the synagogue, having no acknowledged right to reside in Moscow, were also banished. Together with the synagogue the schools connected with it were also closed. Notwithstanding the expenditure of almost 100,000 rubles for the remodeling of the synagogue building, the city authorities will not allow it to be used, and it is now (1904) unoccupied. The Jewish communal organization was abolished and about 20,000 Jews were expelled from the city in April, 1891. Religious services are now held in several prayer-houses (there is a prayer-hall in the house of the millionaire L. Polyakov); and for lack of proper accommodations many Jews find themselves obliged to celebrate the holy days in neighboring towns. Since 1893 the position of rabbi has been filled by A. I. Mase. His assistant was R. Löb Kahn, who died in 1903. There are no official charitable organizations in Moscow; but there is a ḥeder for fifty boys, and the community cares for its poor and sick. Its expenditures are not great, amounting to only 30,000 rubles annually. Not long ago all Jews studying pharmacy and obstetrics were forbidden to live in Moscow. Against the law, the Jewish members of the merchant gild of Moscow are deprived of the right (granted in 1899) to take part in the election of officers of the gild and in sessions of its representatives. Quite recently (1904) the governor-general and commandant of the Moscow military forces, the grand duke Sergei Alecksandrovitch, forbade the Jewish soldiers in the Moscow district to wear fringes ("ẓiẓit"). 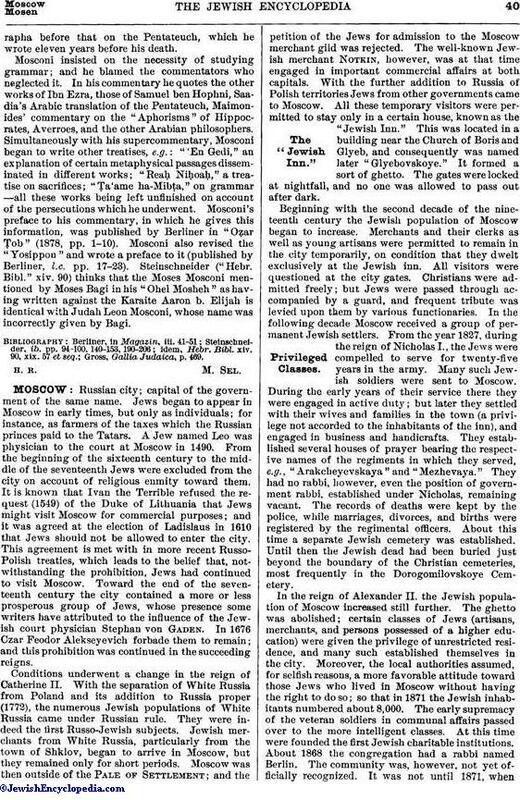 The Jewish population in Moscow consists (1904) of 4,106 permanent residents and 264 temporary settlers. H. Frederic, The New Exodus, pp. 192-208, London, 1892.